The Best Stationary Recumbent Exercise Bike? The One You Will Use! Excy’s Portability Helps! 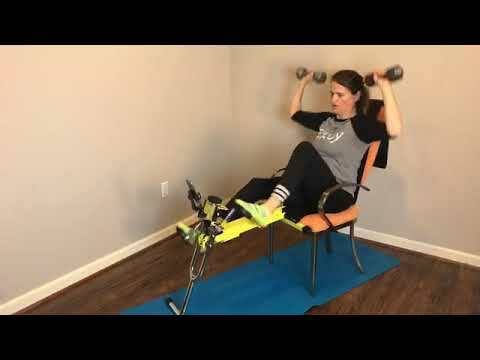 In today’s live stream workout, we used Excy to turn a dinning room chair into a stationary recumbent exercise bike. We also used the Excy Mobile Coach Super Cycle Cardio workout, which is a 23 minute high intensity interval training guided workout. Download the free app to keep on track! The thing that is great about Excy is that it makes the recumbent exercise bike position available anywhere, so don’t hesitate to take it with you! If your couch or chair has a deep surface, try placing a pillow behind your back for added comfort. Why the Stationary Recumbent Exercise Bike Position? A quick search on Amazon for a recumbent exercise bike will turn up almost 800 results. There’s a lot to choose from and we appreciate you selecting Excy. The trick is to put it to use and there are so many reasons to do it! First, you can get an efficient workout while reclining in a very comfortable position with a comfortable seat of your choice. Second, if you leave Excy somewhere that will stare you in the face, it will beg you to get on and start cycling. If you like to ride the stationary recumbent exercise position while watching TV, place Excy somewhere near the TV or the remote. If you like to ride while watching your kiddo’s play sports, keep Excy in the car and carry a stable camping chair. Last but not least, the stationary recumbent exercise bike position is a fun cardiovascular exercise to help to strengthen your heart and lungs and you can crank the resistance up to double dip on cardio and strength training. This article gives some great insight. Always consult a doctor before starting a new exercise routine. Always use Excy with a stable chair.